Investors' new money should not be used to prop up the old guard. For the junta that ruled Myanmar for decades, pandering to Western political demands to entice international financial institutions back to the country was unthinkable. For the country’s new administration however, concerned far more with lasting economic stability than short-term profits, it has become imperative. With a green light to prioritise financial growth, reformists within Myanmar’s quasi-military government seized the reins in July last year. They quickly brought in a long list of reforms that suited Western standards and prompted the International Monetary Fund and the Asian Development Bank to begin preliminary assessments for re-entry. It is a shift in policy that Western financial powers are welcoming with increasingly open arms. Positioned in the midst of economic powerhouses such as China and India and within Southeast Asia, re-engagement with Myanmar has become a must for the West. Yet throwing any kind of financial support at Myanmar’s modified military regime is still a highly contentious subject. Its army – the second largest in Southeast Asia – remains the most powerful institution in the country. It continues to target civilians as part of military strategy and commits rampant extortion, among other abuses. Despite having no external threats, military spending accounts for 14.4% of Myanmar’s new fiscal budget, while the country’s leading banks and major export industries remain largely dominated by Myanmar’s generals. As the floodgates look set to open, now more than ever those assessing re-engagement must scrutinise to what degree the country’s economic potential is controlled by the military. Much of the country’s industry remains in the hands of state-owned companies, such as its main conglomerate, the Union of Myanmar Economic Holding Limited (UMEHL). The first venture started by the army after the 1988 coup, UMEHL later incorporated more than 100 different firms in industries as diverse as gem production, food products and arms imports. Dealing mainly with firms from China, India, Malaysia, Thailand, South Korea, North Korea, Japan and Singapore, for years the UMEHL reported export incomes at the wildly over-inflated official exchange rate of six kyat per dollar, allowing military officials to siphon off huge personal profits. While 40% of the company’s shares are now likely in government hands, owned by the War Office and the Ministry of Defence, the majority are owned by military commanders or by active and retired officers. Though the exchange rate was normalised in April and new laws for investment are being introduced, the government – which is still dominated by members of the former junta – will be careful not to directly threaten the military’s profits from state-owned enterprises too much. In lieu of a functioning judiciary, local and foreign business people in Myanmar have for decades relied on the forming of relations with military personnel to access business opportunities. Commanders of all ranks typically have pwe zar, or brokers, to deal with prospective business partners and arrange the military’s share of the profits. Preferential treatment is also given to relatives of military strongmen. These business-minded family members receive concessions in return for loyalty. For a coterie of other cronies that has dominated big business in Myanmar for the past two decades, loyalty and protection has been hard earned by developing businesses deemed advantageous to the country’s leaders such as procurement of weapons, establishment of offshore bank accounts in Singapore, and the sagacious buying of assets on the behalf of Myanmar’s leaders. 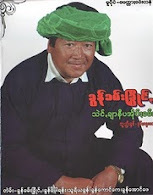 No better is this exemplified than in the cases of Tay Za, the country’s most famous businessman, and Tun Myint Naing, son of drug lord Lo Hsin Han and close associate of Tin Aung Myint Oo, the current vice-president. 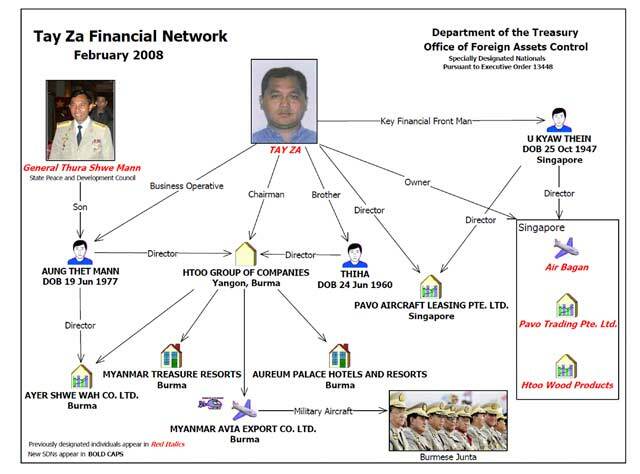 Tay Za’s arms deals with North Korea and Russia on behalf of Myanmar’s leaders, and his decision to run Air Bagan at a loss to suit government targets to improve transportation, have gained him access to huge concessions of state-owned land, among other lucrative benefits. 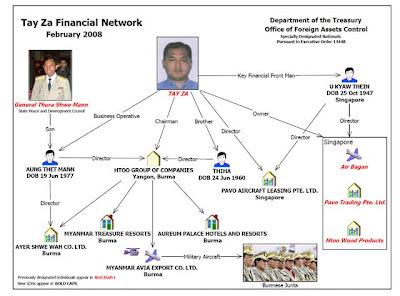 Similarly, Tun Myint Naing is thought to be the richest man in Myanmar thanks largely to his ally Tin Aung Myint Oo, who as head of the recently-abolished Trade Policy Council has given him many contracts associated with major development projects in return for help dealing with foreign banks and building relations with China. This stranglehold on business may be loosened in coming years, however, as the Thein Sein administration makes bold moves to form a more pluralistic, and hopefully less corrupt, business environment. By introducing new legislation in numerous areas, the government is finally allowing the country’s second tier of business people the opportunity to grow. With the majority of Western sanctions likely to be lifted soon, they will gain access to the world’s largest consumer markets, the freedom to use US dollars and, eventually, the support of international financial institutions. Yet with the current system so firmly entrenched, the military’s hold on many areas of business will continue. In Myanmar’s largest industries, such as resource extraction and agribusiness, few companies outside the inner circle have been allowed to develop, making it impossible for them to compete. The peripheral contracts for the country’s largest development projects within these sectors are in the hands of companies such as the Htoo Trading Company and Asia World, owned by Tay Za and Tun Myint Naing respectively. It could be years before we see them challenged by other domestic companies. Bearing this is mind, Western nations and other international investors are right to approach Myanmar with caution. While economic development will likely be the most liberating realm of change to hit Myanmar in coming years, if it is utilised to make the military more powerful, it could also prove to be the most unstable.